"Understanding the ecology of these animals is important to understanding life on Earth through time," said the study's senior author, Michael Habib, an assistant professor of integrative anatomical sciences at the Keck School of Medicine of USC and a research associate at the Natural History Museum. "Are there sharks today that hunt seabirds? Yes, there are. Is that unique or have big sharks been hunting flying creatures for millions of years? The answer is yes, they have. 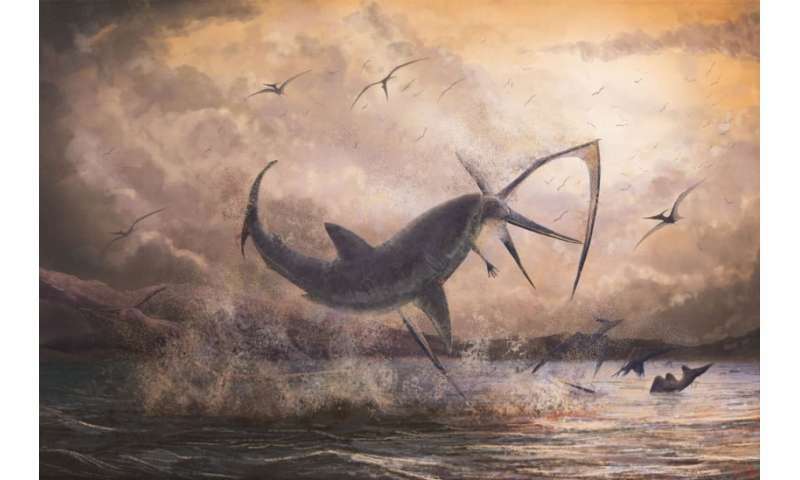 We now know sharks were hunting flying animals as long ago as 80 million years." In the late Cretaceous period, North America was divided by a giant waterway called the Western Interior Seaway. It was a biologically prolific region from the Gulf of Mexico to Canada. Some of the world's best fossils from this time are found here, including the Smoky Hill Chalk region of Kansas, where this specimen was found. First, the scientists had to rule out that the shark tooth, about 1 inch long, wasn't randomly stuck to the Pteranodon vertebra; perhaps had both been deposited in a prehistoric boneyard at the same time. They found that the tooth was stuck between ridges in the neck vertebrae, which was clear evidence of a bite. The tooth belonged to Cretoxyrhina mantelli, a shark common at the time. This particular predator was large, fast and powerful, about 8 feet long and roughly comparable in appearance and behavior to today's great white shark, though it's not closely related. Third, while investigators may never know exactly what happened, Habib said it's possible the attack occurred when the Pteranodon was most vulnerable, sprawled atop the water. While Pteranodon could land and take off on water, they were ungainly at sea and took considerable time to take off. "We know big sharks ate pterosaurs, so we could say a big fast predatory species could very well have eaten this Pteranodon when it entered the water, but we'll probably never know exactly," Habib said. A pterosaur in the jaw is worth two in the swamp? Pterosaurs of a pycnofibers flock together? The early Anurognathids gets the worm? Take you under my Brachiopatagium? Happy as a Lanceodontia, crazy as a Lonchodectes, silly as a Gallodactylidae, dumb as a Dimorphodon? I know. I'm such a Macronychoptera-brain, huh? Zero evidence in the article that the fearsome shark took down the pterosaur in mid-flight other than in the headline writer's imagination.